The Iberosattel development team is continually working to make riding for horses and riders even more comfortable and enjoyable while ensuring the highest quality. The latest coup: a world novelty in the saddle system! No friction. No pressure. Only freedom. Iberosattel is now presenting a new saddle tree with integrated Titanium steel headers: the EWF system for Extragroger Widerristfreiheit. Hitherto, the head was placed underneath the saddle tree and covered only with thin leather - and at a very sensitive place between the spine and the iron, which could have painful consequences for horses in certain situations. Thanks to the new system, no more edges are disturbed, and the saddle tree remains light, flexible and always adjustable, despite the fact that the saddle is up to 12 mm wide! Since a horse is undergoing physical changes in the course of his / her life, as a human being, we also lose weight and muscle, a conventional saddle can never fit 100% life-long - we wanted to meet that challenge! In elaborate tests, our experts noted that a strong head or a gallop could touch a normal head of the spine. 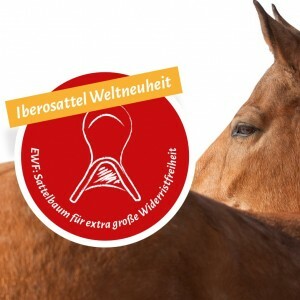 Iberosattel's new EWF system, on the other hand, prevents these shocks and increases the freedom to wither because the head has been integrated far into the saddle tree. A contact with the spine thus takes place in the absolute exceptional case with leather or plastic, not with iron. Your horse runs freer and relaxed thanks to the great freedom from shoulder and wither. A saddle with the new head can also avoid arthrosis in the withers area and problems in the region of the scapuloplasty. The increased shoulder-freeness also provides for easier bending and, as a consequence, an improved fit because the saddle tree is flat on the horse without a point-to-point increase. The Amazon solution known from Iberosattel is of course integrated and invites riders with seat size 17.5, 18 and 18 plus for comfortable riding. The comfort pad ensures optimal pressure distribution and the finest aid - riding as on cloud 7 becomes reality! The EWF system has been protected by the trademark and patent office, so it is available worldwide exclusively and exclusively at Iberosattel.